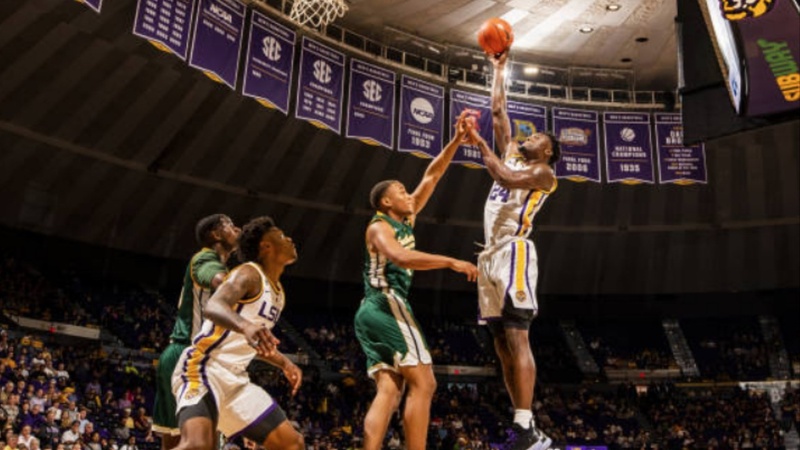 Six players, including all four freshmen, scored in double figures as LSU defeated Southeastern Louisiana 94-63 in the season-opener for both teams at the PMAC on Tuesday night. After scoring the first ten points of the game, LSU saw its advantage trimmed to six points at 17-11 on a basket by Maxwell Starwood with 12:04 remaining in the first half. The Tigers then took control of the game by scoring 12 consecutive points. Emmitt Williams scored eight of those 12 points as LSU went ahead 29-11. The Tigers expanded their lead to 30 points at 48-18 by halftime. Williams, who started in the post along with Naz Reid, registered a double-double in his first collegiate game. Williams finished with 12 points and 10 rebounds in just 16 minutes. Williams, who was 5-of-7 from the field, grabbed seven offensive rebounds. His spurt during the middle stages of the first half enabled the Tigers to build a comfortable lead. LSU’s starting lineup consisted of Reid and Williams in the post, Smart and Mays on the wings and Waters at point guard. No Tigers player was on the floor for more than 27 minutes. Nine players logged at least 15 minutes. . .LSU’s four freshmen – Reid, Williams, Days and Smart – combined for 50 points and 26 rebounds. Those four players were a combined 18-of-34 from the field. . .Not to be overlooked was the contribution from Taylor, a junior college transfer. Taylor made five of his eight field goal attempts. He was also 4-of-6 at the foul line. . .Waters only scored nine points and handed out just two assists. However, Waters scored seven points while the Tigers jumped out to a 13-2 lead. . .Kavell Bigby-Williams had seven points and four rebounds in 21 minutes. He blocked three shots. . .Daryl Edwards, who also played 21 minutes, did not score. . .Walk-ons Marshall Graves and Will Reese each played six minutes. Graves made two free throws. . .Veal, SLU’s returning All-Southland Conference point guard, was held to one point in 26 minutes. Veal, who played with a knee injury, missed all five of his field goal attempts. . .Edwards, a freshman from Covington (La.) St. Paul’s High School, was the game-high scorer with 25 points. Edwards scored 25 consecutive points for the Lions in a six-minute stretch of the second half. . .LSU extended its homecourt winning streak to eight games. The Tigers also won their fourth straight season-opener. LSU’s last season-opening game defeat came at Massachusetts five years ago. The Tigers have not lost a home opener since the 1986-87 season when they were beaten by TCU. . .Following the game, there was a ceremony in memory of Wayde Sims, who was shot and killed in September. A video was shown honoring Sims, who would have been a junior on this season’s team. . .The paid attendance was 10,513. The actual crowd was a little less than 7,000. LSU will play host to North Carolina-Greensboro at the PMAC on Friday. Tipoff is scheduled for 7 p.m. Central. The Spartans defeated North Carolina A&T 74-66 in Greensboro on Tuesday night. The LSU-UNC-Greensboro game will be available on the SEC Digital Network.